At the end of this month, Nintendo will be re-releasing a game. It's beautiful. An all-time classic. And it's...not a video game. 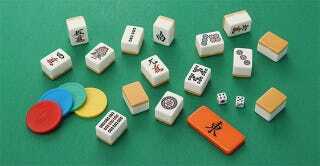 Going back to the company's roots, back when it made real games, this exquisite Mahjong set will go on sale in Japan for just under USD$200. Which isn't cheap, but look at this thing. There's not a Mario or Link in sight; just classic Mahjong with a Nintendo logo, all in a gorgeous box. There's also a mat for $50. Which, I don't know, could pull double duty for Pokémon games.